6 Ways to Soothe Proper Hair Naturally - Having a smooth, soft, shiny, and easily styled hair is certainly a dream of all women. With soft hair, anyone will surely feel more confident. To realize that dream even even some of us willing to spend a lot of cost. 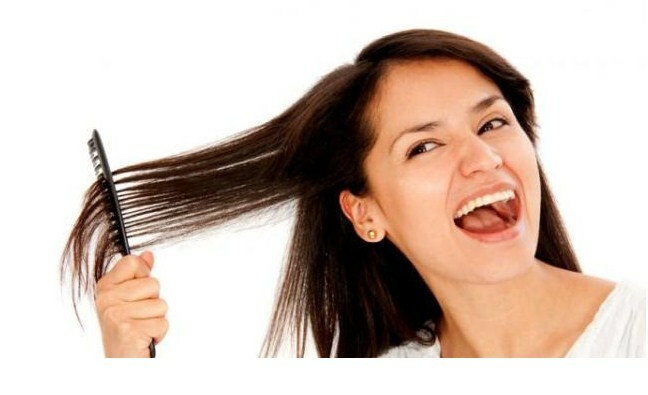 Before you try expensive treatments, you should apply first how to smooth the hair naturally. Indeed the natural way tends to be longer and complicated, but with patience and consistent use guaranteed your hair will be softer and healthier permanent later. Everyone has different hair types. Choose a shampoo that suits your hair type. It is also advisable to choose a shampoo labeled "sulphate free" but has a 'dimethicone' substance that is more lustrous and manageable. Sulfate is proven effective in removing dirt and excess oil in the hair, but the substance can also potentially damage your hair. Also do not hesitate to shampoo every two or three days, because rarely shampoo it will make the hair rough and damaged. The conditioner is very useful in softening and nourishing your hair. After finish shampooing, apply conditioner evenly throughout the hair. Let stand briefly to permeate perfectly into each strand. In addition to smoothing hair, conditioner is also useful to prevent branching hair, prevent discoloration, and even overcome hair damage due to excessive sun exposure. Note: because each conditioner is different benefits so adjust to your hair type yes. Let's start now use a hair mask at least once a week. Hairdressers recommend that we use a mask that contains keratin, amino acids, and essential fatty acids to be softer. Or you can also make your own natural hair mask by mixing avocado and mayonnaise. This mask has been proven enough to help soften dry hair and dull. After that cool and rinse hair with clean water. In addition to avocado and mayonnaise, you can also make a hair mask from honey, aloe vera, yoghurt, egg yolks, and bananas. If you do not have much time to make a hair mask, it is better to use vegetable oil only. Once a week try to apply vegetable oils such as olive oil, coconut oil, and almond oil. After the oil is applied do not forget to massage it to get to the hair root, then let stand for the night. Then wash your hair without using shampoo and conditioner on the next day. Many good nutritious foods for hair, such as salmon and nuts. Both foods contain protein and omega 3 fatty acids that can help maintain healthy scalp. In addition, you can also eat foods that contain a source of vitamin D, biotin, and iron to make hair more natural and healthy shine. From now on reduce the use of dye, straightener or curling hair, and blow dry. Chemicals present in hair dye or hot air spray from the dryer can make hair rough, dry, and damaged. Do not forget to protect your hair from the sun by wearing hijab, hat, or umbrella. That's how to smooth the hair naturally that you must try now. Good luck and do not forget to share the results in the comment field yes. 0 Response to "6 Ways to Soothe Proper Hair Naturally"